It is 1942, America has entered World War II, and sickly but determined Steve Rogers (Chris Evans) is frustrated at being rejected yet again for military service. Everything changes when Dr. Erksine recruits him for the secret Project Rebirth. Proving his extraordinary courage, wits and conscience, Rogers undergoes the experiment and his weak body is suddenly enhanced into the maximum human potential. When Dr. Erksine is then immediately assassinated by an agent of Nazi Germany's head of its secret HYDRA research department, Johann Schmidt (Hugo Weaving) aka the Red Skull, Rogers is left as a unique man who is initially misused as a propaganda mascot. 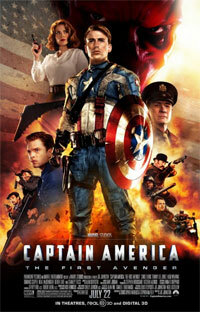 However, when his comrades need him, Rogers goes on a successful adventure that truly makes him Captain America and his war against Schmidt begins.